One of the first scholars to perform genetic studies was Luigi Luca Cavalli-Sforza. He used classical genetic markers to analyse DNA by proxy. This method studies differences in the frequencies of particular allelic traits, namely polymorphisms from proteins found within human blood (such as the ABO blood groups, Rhesus blood antigens, HLA loci, immunoglobulins, G-6-P-D isoenzymes, among others). Subsequently his team calculated genetic distance between populations, based on the principle that two populations that share similar frequencies of a trait are more closely related than populations that have more divergent frequencies of the trait. Since then, population genetics has progressed significantly and studies using direct DNA analysis are now abundant and may use mitochondrial DNA (mtDNA), the non-recombining portion of the Y chromosome (NRY) or autosomal DNA. MtDNA and NRY DNA share some similar features which have made them particularly useful in genetic anthropology. These properties include the direct, unaltered inheritance of mtDNA and NRY DNA from mother to offspring and father to son, respectively, without the 'scrambling' effects of genetic recombination. We also presume that these genetic loci are not affected by natural selection and that the major process responsible for changes in base pairs has been mutation (which can be calculated). Whereas Y-DNA and mtDNA haplogroups represent but a small component of a person’s DNA pool, autosomal DNA has the advantage of containing hundreds and thousands of examinable genetic loci, thus giving a more complete picture of genetic composition. Descent relationships can only to be determined on a statistical basis, because autosomal DNA undergoes recombination. A single chromosome can record a history for each gene. Autosomal studies are much more reliable for showing the relationships between existing populations but do not offer the possibilities for unraveling their histories in the same way as mtDNA and NRY DNA studies promise, despite their many complications. Genetic studies operate on numerous assumptions and suffer from methodological limitations such as selection bias and confounding. Phenomenon like genetic drift, foundation and bottleneck effects cause large errors, particularly in haplogroup studies. No matter how accurate the methodology, conclusions derived from such studies are compiled on the basis of how the author envisages their data fits with established archaeological or linguistic theories. Y-Chromosome haplogroup distributions in Iberian Peninsula. Y-Chromosome haplogroup distributions in Europe. DNA analysis shows that Spanish and Portuguese populations are most closely related to other populations of western Europe. Y-chromosome analysis had suggested Paleolithic ancestry among populations in the Iberian Peninsula and that Iberia may have played a role in the re-population of western Europe after the last glaciation. This shows an ancestral bond between Iberia and the rest of western Europe, and in particular with Atlantic Europe, which share high frequencies of these haplogroups. R1b1a2, the most common western European haplogroup, arose 4,000 to 8,000 years ago in southwest Asia and later spread to Europe. Haplogroup composition of the ancient Iberians was very similar to that found in the modern Iberian Peninsula populations, suggesting a long-term genetic continuity since pre-Roman times. Y-DNA Haplogroup R1b, mostly from the P312 clade, is the most frequent among Spaniards and Portuguese, occurring at over 50% throughout Spain. Although the clade prevails in much of West Europe, a key difference is found among Iberians and the rest in the specific Iberian subclade P312 negative for M529, U152 (i.e. mainly DF27). This subclade emerged before the Roman Empire and as a founder lineage usually constitutes much more than the half of the total R1b in the Iberian Peninsula, a lower high frequency may occur in France. No migrations managed to outnumber the clade or reduce it significantly, but it falls to only two thirds of the total R1b in Valencia and the sea coast. DF27 is significant part of R1b in parts of France and UK, but insignificant in Italy. Ancient Rome is the source of the Latin languages, but brought a low genetic impact. The R-S28 (U152) in total represents under 5% of the total population, which is the prevailing subclade of R1b in Italy, Switzerland and parts of France, the best possible major candidate haplogroup of Roman colonists. U152 is represented at frequencies of 3% in Cantabria and Santander, 2% in Castille and Leon, 6% in Valencia, under 1% in Andalusia, but rises drastically in Seville and Barcelona to over 10-20% of the total population. The DF27 Iberian clade occurs at between 40-48% of the total Y chromosomes in Madrid, Alicante, Barcelona, Cantabria, Andalucia, Asturias and Galicia, but at over 60% in the Basque Country. This means that although African (especially Moor), Eastern (Phoenician, Sephardic, Arab, Greek), Northern European and Roman genetic impacts in the paternal line of the Iberians (Spaniards and Portuguese) are present, they are a minority among the pre-migration Iberian component. E-V68 is dominated by its longer-known subclade E-M78. In various publications, both E-V68 and E-M78 have been referred to by other names, especially phylogenetic names such as "E3b1a" which are designed to show their place on the family tree of all humans. It has also been argued that the European distribution of E-M78 and its sub-clades is compatible with the Neolithic demic diffusion of agriculture. For example, Battaglia et al. (2007) estimated that E-M78 (called E1b1b1a1 in that paper) has been in Europe longer than 10,000 years. In support of this theory, human remains excavated in a Spanish funeral cave dating from approximately 7,000 years ago were shown to be in this haplogroup. More recently, two E-M78 have been found in the Neolitich Sopot and Lengyel cultures from the same period. In human genetics, Haplogroup I-M170 is a Y-chromosome DNA haplogroup, a subgroup of haplogroup IJ, itself a derivative of Haplogroup IJK. Y-DNA Haplogroup I-M170 is predominantly a European haplogroup and it is considered as the only native European Haplogroup. Today it represents nearly one-fifth of the population of Europe. It can be found in the majority of present-day European populations with peaks in Northern and South-Eastern Europe. Haplogroup I-M170 Y-chromosomes have also been found among some populations of the Near East, the Caucasus, Northeast Africa and Central Siberia. In Iberia Haplogroup I2 and Haplogroup I1 constitute roughly the same frequency. R-M420 (R1a) is a common Y DNA haplogroup in many parts of Eurasia. One sub-clade (branch) of R-M420, R-M17 (R1a1a), is much more common than the others in all major geographical regions. R-M17, defined by the SNP mutation M17, (and sometimes alternatively defined as R-M198), is particularly common in a large region extending from Southern Siberia to Central Europe and Scandinavia. (Underhill 2009) The prevalent subclade is Eastern European R-Z280(especially R-CTS3402), not Scandinavian R-Z284. MtDNA haplogroup frequencies in the main Iberian regions. There have been a number of studies about the mitochondrial DNA haplogroups (mtDNA) in Europe. In contrast to Y DNA haplogroups, mtDNA haplogroups did not show as much geographical patterning, but were more evenly ubiquitous. Apart from the outlying Sami, all Europeans are characterized by the predominance of haplogroups H, U and T. The lack of observable geographic structuring of mtDNA may be due to socio-cultural factors, namely patrilocality and a lack of polyandry. H1 encompasses an important fraction of Western European mtDNA, reaching its local peak among contemporary Basques (27.8%) and appearing at a high frequency among other Iberians and North Africans. Its frequency is above 10% in many other parts of Europe (France, Sardinia, British Isles, Alps, large portions of Eastern Europe), and above 5% in nearly all the continent. Its subclade H1b is most common in eastern Europe and NW Siberia. So far, the highest frequency of H1 - 61%- has been found among the Tuareg of the Fezzan region in Libya. H3 represents a smaller fraction of European genome than H1 but has a somewhat similar distribution with peak among Basques (13.9%), Galicians (8.3%) and Sardinians (8.5%). Its frequency decreases towards the northeast of the continent, though. Studies have suggested haplogroup H3 is highly protective against AIDS progression. A 2007 European-wide study including Spanish Basques and Valencian Spaniards, found Iberian populations to cluster the furthest from other continental groups, implying that Iberia holds the most ancient European ancestry. In this study, the most prominent genetic stratification in Europe was found to run from the north to the south-east, while another important axis of differentiation runs east-west across the continent. It also found, despite the differences, that all Europeans are closely related. A number of studies have focused on ascertaining the genetic impact of historical North African population movements into Iberia on the genetic composition of modern Spanish and Portuguese populations. Although initial studies pointed to the Straits of Gibraltar acting more as a genetic barrier than a bridge, more recent studies point to a higher level of recent North African admixture among Iberians than among other European populations. In terms of autosomal DNA, the most recent study regarding African admixture in Iberian populations was conducted in April 2013 by Botigué et al. using genome-wide SNP data for over 2000 individuals, concluding that Spain and Portugal hold significantly higher levels of North African than the rest of the European continent. Estimates of shared ancestry averaged between 4 and 20% whereas these did not exceed 2% in other western or southern European populations. The highest level of North African ancestry (20%) was found in the Canary Islands while in the Iberian Peninsula it averaged 10–12%. However, contrary to past autosomal studies and to what is inferred from Y-Chromosome and Mitochondrial Haplotype frequencies(see below), it does not detect significant levels of Sub-Saharan ancestry in any European population outside the Canary Islands. Indeed, a prior 2011 autosomal study by Moorjani et al. found Sub-Saharan ancestry throughout Europe at ranges of between 1-3%, "the highest proportion of African ancestry in Europe is in Iberia (Portugal 3.2±0.3% and Spain 2.4±0.3%), consistent with inferences based on mitochondrial DNA and Y chromosomes and the observation by Auton et al. that within Europe, the Southwestern Europeans have the highest haplotype-sharing with Africans." A similar 2014 study by Lazaridis et al. found an average African admixture of 14.8% (12.6% Mozabite and 2.2% Mbuti/Yoruba) in the Spanish population, confirming that gene flow from Sub-Saharan and North African populations has occurred in the Spanish sample. In terms of paternal Y-Chromosome DNA, recent studies coincide in that Iberia has the greatest presence of the typically Northwest African Y-chromosome haplotype marker E-M81 in Europe. as well as Haplotype Va. Estimates of Y-Chromosome ancestry vary, with a 2008 study published in the American Journal of Human Genetics using 1140 samples from throughout the Iberian peninsula, giving a proportion of 10.6% North African ancestry. A similar 2009 study of Y-chromosome with 659 samples from Portugal, 680 from Northern Spain, 37 samples from Andalusia, 915 samples from mainland Italy, and 93 samples from Sicily found significally higher levels of North African male ancestry in Spain, Sicily and Portugal (7.7%, 7.1% and 7.5% respectively) than in Italy (1.7%). Earlier studies of the Iberian gene-pool had estimated significantly lower levels of North African Ancestry. According to Bosch et al. 2000 "NW African populations may have contributed 7% of Iberian Y chromosomes". A wide-ranging study by Cruciani et al. 2007, using 6,501 unrelated Y-chromosome samples from 81 populations found that: "Considering both these E-M78 sub-haplogroups (E-V12, E-V22, E-V65) and the E-M81 haplogroup, the contribution of northern African lineages to the entire male gene pool of Iberia (barring Pasiegos), continental Italy and Sicily can be estimated as 5.6 percent, 3.6 percent and 6.6 percent, respectively". Recent Mitochondrial DNA studies coincide in that the Iberian Peninsula holds higher levels of typically North African Haplotype U6, as well as higher frequencies of Sub-Saharan African Haplogroup L. However, high frequencies are largely concentrated in the west and south of the Iberian peninsula and therefore overall frequency is higher in Portugal (5.83%) than in Spain (2.9%) with a mean frequency for the entire peninsula of 3.83%. There is considerable geographic divergence across the peninsula with high frequencies observed for South West Castile (18%), Southern Portugal (10.80%), Central Portugal (9.70%), Western Andalusia (14.6%) and Córdoba (8.30%). Current debates revolve around whether U6 presence is due to Islamic expansion into the Iberian peninsula or prior population movements and whether Haplogroup L is linked to the slave trade or prior population movements linked to Islamic expansion. A majority of Haplogroup L lineages in Iberia being North African in origin points to the latter. In 2015, Hernández et al. concluded that "the estimated entrance of the North African U6 lineages into Iberia at 10 ky correlates well with other L African clades, indicating that some U6 and L lineages moved together from Africa to Iberia in the Early Holocene while a majority were introduced during historic times." Wikimedia Commons has media related to Genetic studies on Iberian Peninsula. ↑ Nelis, Mari; Esko, Tõnu; Mägi, Reedik; Zimprich, Fritz; Zimprich, Alexander; Toncheva, Draga; Karachanak, Sena; Piskácková, Tereza; Balascák, Ivan; Peltonen, L; Jakkula, E; Rehnström, K; Lathrop, M; Heath, S; Galan, P; Schreiber, S; Meitinger, T; Pfeufer, A; Wichmann, HE; Melegh, B; Polgár, N; Toniolo, D; Gasparini, P; d'Adamo, P; Klovins, J; Nikitina-Zake, L; Kucinskas, V; Kasnauskiene, J; Lubinski, J; Debniak, T (2009). Fleischer, Robert C., ed. 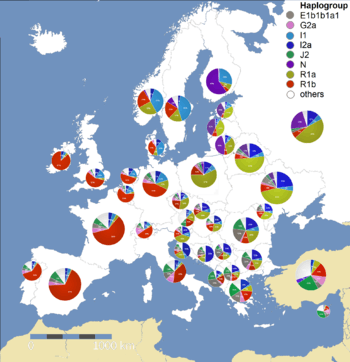 "Genetic Structure of Europeans: A View from the North–East". PLoS ONE. 4 (5): e5472. Bibcode:2009PLoSO...4.5472N. doi:10.1371/journal.pone.0005472. PMC 2675054 . PMID 19424496. ↑ Wade, Nicholas (13 August 2008). 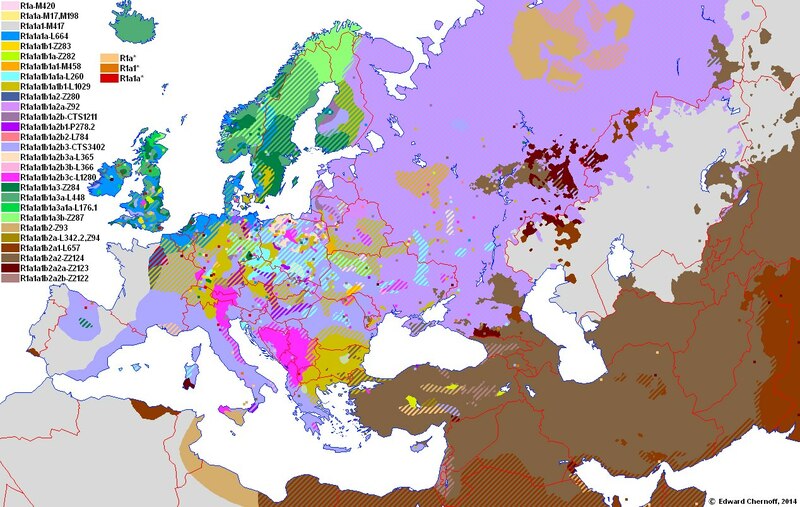 "The Genetic Map of Europe". The New York Times. Retrieved 17 October 2009. ↑ Novembre, John; Johnson, Toby; Bryc, Katarzyna; Kutalik, Zoltán; Boyko, Adam R.; Auton, Adam; Indap, Amit; King, Karen S.; Bergmann, Sven; Nelson, Matthew R.; Stephens, Matthew; Bustamante, Carlos D. (2008). "Genes mirror geography within Europe". Nature. 456 (7218): 98–101. Bibcode:2008Natur.456...98N. doi:10.1038/nature07331. PMC 2735096 . PMID 18758442. Lay summary – Gene Expression (31 August 2008). 1 2 Adams, Susan M.; Bosch, Elena; Balaresque, Patricia L.; Ballereau, Stéphane J.; Lee, Andrew C.; Arroyo, Eduardo; López-Parra, Ana M.; Aler, Mercedes; Grifo, Marina S. Gisbert; Brion, Maria; Carracedo, Angel; Lavinha, João; Martínez-Jarreta, Begoña; Quintana-Murci, Lluis; Picornell, Antònia; Ramon, Misericordia; Skorecki, Karl; Behar, Doron M.; Calafell, Francesc; Jobling, Mark A. "The Genetic Legacy of Religious Diversity and Intolerance: Paternal Lineages of Christians, Jews, and Muslims in the Iberian Peninsula". The American Journal of Human Genetics. 83 (6): 725–736. doi:10.1016/j.ajhg.2008.11.007. ↑ Flores, Carlos; Maca-Meyer, Nicole; González, Ana M.; Oefner, Peter J.; Shen, Peidong; Pérez, Jose A.; Rojas, Antonio; Larruga, Jose M.; Underhill, Peter A. (28 July 2004). "Reduced genetic structure of the Iberian peninsula revealed by Y-chromosome analysis: implications for population demography". European Journal of Human Genetics. 12 (10): 855–863. doi:10.1038/sj.ejhg.5201225. ISSN 1018-4813. ↑ McDonald, J. D. (2005). "Y Haplogroups of the World" (PDF). Retrieved 17 October 2009. ↑ Flores, Carlos; Maca-Meyer, Nicole; González, Ana M; Oefner, Peter J; Shen, Peidong; Pérez, Jose A; Rojas, Antonio; Larruga, Jose M; Underhill, Peter A (2004). "Reduced genetic structure of the Iberian peninsula revealed by Y-chromosome analysis: implications for population demography". European Journal of Human Genetics. 12 (10): 855–63. doi:10.1038/sj.ejhg.5201225. PMID 15280900. ↑ Sampietro, M. L.; Caramelli, D.; Lao, O.; Calafell, F.; Comas, D.; Lari, M.; Agustí, B.; Bertranpetit, J.; Lalueza-Fox, C. (2005). "The Genetics of the Pre-Roman Iberian Peninsula: A mtDNA Study of Ancient Iberians". Annals of Human Genetics. 69 (Pt 5): 535–48. doi:10.1111/j.1529-8817.2005.00194.x. PMID 16138912. ↑ Comas, David; Calafell, Francesc; Benchemsi, Noufissa; Helal, Ahmed; Lefranc, Gerard; Stoneking, Mark; Batzer, Mark A.; Bertranpetit, Jaume; Sajantila, Antti (2000). "Alu insertion polymorphisms in NW Africa and the Iberian Peninsula: evidence for a strong genetic boundary through the Gibraltar Straits". Human Genetics. 107 (4): 312–9. doi:10.1007/s004390000370. PMID 11129330. 1 2 3 Myres, Natalie M.; Rootsi, Siiri; Lin, Alice A.; Järve, Mari; King, Roy J.; Kutuev, Ildus; Cabrera, Vicente M.; Khusnutdinova, Elza K.; Pshenichnov, Andrey; Yunusbayev, Bayazit; Balanovsky, Oleg; Balanovska, Elena; Rudan, Pavao; Baldovic, Marian; Herrera, Rene J.; Chiaroni, Jacques; Di Cristofaro, Julie; Villems, Richard; Kivisild, Toomas; Underhill, Peter A. (1 January 2011). "A major Y-chromosome haplogroup R1b Holocene era founder effect in Central and Western Europe". European Journal of Human Genetics. 19 (1): 95–101. doi:10.1038/ejhg.2010.146. ISSN 1018-4813. ↑ "Molecular genetic investigation of the Neolithic population history in the western Carpathian Basin" (PDF). 1 2 3 Pereira L, Cunha C, Alves C, Amorim A (April 2005). "African female heritage in Iberia: a reassessment of mtDNA lineage distribution in present times". Human Biology. 77 (2): 213–29. doi:10.1353/hub.2005.0041. PMID 16201138. ↑ Loogväli EL, Roostalu U, Malyarchuk BA, et al. (November 2004). "Disuniting uniformity: a pied cladistic canvas of mtDNA haplogroup H in Eurasia". Molecular Biology and Evolution. 21 (11): 2012–21. doi:10.1093/molbev/msh209. PMID 15254257. ↑ Hendrickson SL, Hutcheson HB, Ruiz-Pesini E, et al. (November 2008). "Mitochondrial DNA Haplogroups influence AIDS Progression". AIDS. 22 (18): 2429–39. doi:10.1097/QAD.0b013e32831940bb. PMC 2699618 . PMID 19005266. ↑ Bauchet, M; McEvoy, B; Pearson, LN; Quillen, EE; Sarkisian, T; Hovhannesyan, K; Deka, R; Bradley, DG; Shriver, MD (2007). "Measuring European Population Stratification with Microarray Genotype Data". The American Journal of Human Genetics. 80 (5): 948–56. doi:10.1086/513477. PMC 1852743 . PMID 17436249. ↑ Dupanloup, I.; Bertorelle, G; Chikhi, L; Barbujani, G (2004). "Estimating the Impact of Prehistoric Admixture on the Genome of Europeans". Molecular Biology and Evolution. 21 (7): 1361–72. doi:10.1093/molbev/msh135. PMID 15044595. ↑ Bosch, Elena; Calafell, Francesc; Comas, David; Oefner, Peter J.; Underhill, Peter A.; Bertranpetit, Jaume (2001). "High-Resolution Analysis of Human Y-Chromosome Variation Shows a Sharp Discontinuity and Limited Gene Flow between Northwestern Africa and the Iberian Peninsula". The American Journal of Human Genetics. 68 (4): 1019–29. doi:10.1086/319521. PMC 1275654 . PMID 11254456. 1 2 Moorjani P, Patterson N, Hirschhorn JN, Keinan A, Hao L, et al. (2011). McVean G, ed. "The History of African Gene Flow into Southern Europeans, Levantines, and Jews". PLoS Genet. 7 (4): e1001373. doi:10.1371/journal.pgen.1001373. PMC 3080861 . PMID 21533020. 1 2 Capelli, Cristian; Onofri, Valerio; Brisighelli, Francesca; Boschi, Ilaria; Scarnicci, Francesca; Masullo, Mara; Ferri, Gianmarco; Tofanelli, Sergio; Tagliabracci, Adriano; Gusmao, Leonor; Amorim, Antonio; Gatto, Francesco; Kirin, Mirna; Merlitti, Davide; Brion, Maria; Verea, Alejandro Blanco; Romano, Valentino; Cali, Francesco; Pascali, Vincenzo (2009). "Moors and Saracens in Europe: estimating the medieval North African male legacy in southern Europe". European Journal of Human Genetics. 17 (6): 848–52. doi:10.1038/ejhg.2008.258. PMC 2947089 . PMID 19156170. 1 2 Semino, Ornella; Magri, Chiara; Benuzzi, Giorgia; Lin, Alice A.; Al-Zahery, Nadia; Battaglia, Vincenza; MacCioni, Liliana; Triantaphyllidis, Costas; Shen, Peidong; Oefner, Peter J.; Zhivotovsky, Lev A.; King, Roy; Torroni, Antonio; Cavalli-Sforza, L. Luca; Underhill, Peter A.; Santachiara-Benerecetti, A. Silvana (2004). "Origin, Diffusion, and Differentiation of Y-Chromosome Haplogroups E and J: Inferences on the Neolithization of Europe and Later Migratory Events in the Mediterranean Area". The American Journal of Human Genetics. 74 (5): 1023–34. doi:10.1086/386295. PMC 1181965 . PMID 15069642. ↑ Gérard, Nathalie; Berriche, Sala; Aouizérate, Annie; Diéterlen, Florent; Lucotte, Gérard (2006). "North African Berber and Arab Influences in the Western Mediterranean Revealed by Y-Chromosome DNA Haplotypes". Human Biology. 78 (3): 307–16. doi:10.1353/hub.2006.0045. PMID 17216803. 1 2 3 4 5 6 7 8 Adams, Susan M.; Bosch, Elena; Balaresque, Patricia L.; Ballereau, Stéphane J.; Lee, Andrew C.; Arroyo, Eduardo; López-Parra, Ana M.; Aler, Mercedes; Grifo, Marina S. Gisbert; Brion, Maria; Carracedo, Angel; Lavinha, João; Martínez-Jarreta, Begoña; Quintana-Murci, Lluis; Picornell, Antònia; Ramon, Misericordia; Skorecki, Karl; Behar, Doron M.; Calafell, Francesc; Jobling, Mark A. (2008). "The Genetic Legacy of Religious Diversity and Intolerance: Paternal Lineages of Christians, Jews, and Muslims in the Iberian Peninsula". The American Journal of Human Genetics. 83 (6): 725–36. doi:10.1016/j.ajhg.2008.11.007. PMC 2668061 . PMID 19061982. Lay summary – Science News (3 January 2009). 1 2 3 4 5 González, Ana M.; Brehm, Antonio; Pérez, José A.; Maca-Meyer, Nicole; Flores, Carlos; Cabrera, Vicente M. (2003). "Mitochondrial DNA affinities at the Atlantic fringe of Europe". American Journal of Physical Anthropology. 120 (4): 391–404. doi:10.1002/ajpa.10168. PMID 12627534. 1 2 3 Giacomo, F.; Luca, F.; Popa, L. O.; Akar, N.; Anagnou, N.; Banyko, J.; Brdicka, R.; Barbujani, G.; et al. (2004). "Y chromosomal haplogroup J as a signature of the post-neolithic colonization of Europe". Human Genetics. 115 (5): 357–71. doi:10.1007/s00439-004-1168-9. PMID 15322918. ↑ Botigué, LR; Henn, BM; Gravel, S; Maples, BK; Gignoux, CR; Corona, E; Atzmon, G; Burns, E; Ostrer, H; Flores, C; Bertranpetit, J; Comas, D; Bustamante, CD (July 16, 2013). "Gene flow from North Africa contributes to differential human genetic diversity in southern Europe". Proceedings of the National Academy of Sciences of the United States of America. 110 (29): 11791–11796. Bibcode:2013PNAS..11011791B. doi:10.1073/pnas.1306223110. PMC 3718088 . PMID 23733930. ↑ Bosch, E; Calafell, F; Comas, D; Oefner, PJ; Underhill, PA; Bertranpetit, J (April 2001). "High-resolution analysis of human Y-chromosome variation shows a sharp discontinuity and limited gene flow between northwestern Africa and the Iberian Peninsula". Am. J. Hum. Genet. 68: 1019–29. doi:10.1086/319521. PMC 1275654 . PMID 11254456. ↑ Cruciani, F.; La Fratta, R.; Trombetta, B.; Santolamazza, P.; Sellitto, D.; Colomb, E. B.; Dugoujon, J. -M.; Crivellaro, F.; Benincasa, T. (2007). "Tracing Past Human Male Movements in Northern/Eastern Africa and Western Eurasia: New Clues from Y-Chromosomal Haplogroups E-M78 and J-M12". Molecular Biology and Evolution. 24 (6): 1300–1311. doi:10.1093/molbev/msm049. PMID 17351267. ↑ Plaza, S.; Calafell, F.; Helal, A.; Bouzerna, N.; Lefranc, G.; Bertranpetit, J.; Comas, D. (2003). "Joining the Pillars of Hercules: mtDNA Sequences Show Multidirectional Gene Flow in the Western Mediterranean". Annals of Human Genetics. 67 (Pt 4): 312–28. doi:10.1046/j.1469-1809.2003.00039.x. PMID 12914566. ↑ Pereira, Luisa; Cunha, Carla; Alves, Cintia; Amorim, Antonio (2005). "African Female Heritage in Iberia: A Reassessment of mtDNA Lineage Distribution in Present Times". Human Biology. 77 (2): 213–29. doi:10.1353/hub.2005.0041. PMID 16201138. 1 2 3 Brehm A, Pereira L, Kivisild T, Amorim A (December 2003). "Mitochondrial portraits of the Madeira and Açores archipelagos witness different genetic pools of its settlers". Human Genetics. 114 (1): 77–86. doi:10.1007/s00439-003-1024-3. PMID 14513360. 1 2 Pereira, Luisa; Cunha, Carla; Alves, Cintia; Amorim, Antonio (2005). "African Female Heritage in Iberia: A Reassessment of mtDNA Lineage Distribution in Present Times". Human Biology. 77 (2): 213–29. doi:10.1353/hub.2005.0041. PMID 16201138. ↑ Alvarez; et al. (2010). "Mitochondrial DNA Patterns in the Iberian Northern Plateau: Population Dynamics and Substructure of the Zamora Province". Am. J. Phys. Anthropol. 142: 531–9. doi:10.1002/ajpa.21252. PMID 20127843.